You can take the Bong out of Bangla but you cannot take the Bangla out of the Bong! And as you sink into the poetic lingo of Koral Dasgupta’s Fall Winter Collections, that’s the precise thought that crosses your mind. Having spent many a winter vacation in the by-lanes of Shantiniketan, experiencing Poush Mela as a kid, every descriptive as seen from the eyes of the protagonist, Sanghamitra Banerjee, seemed far too real to me and it was as if I am walking in her shoes. Sanghamitra appears detached, sort of distancing herself from all the happenings of the plotline, until you discover her story. A stark contrast to her ethos and sensibilities is Dr Aniruddh Jain Solanki, who is also a fellow teacher at the world renowned Viswa Bharati University, like Sanghamitra. But, it is this contrast that finally draws the two closer. 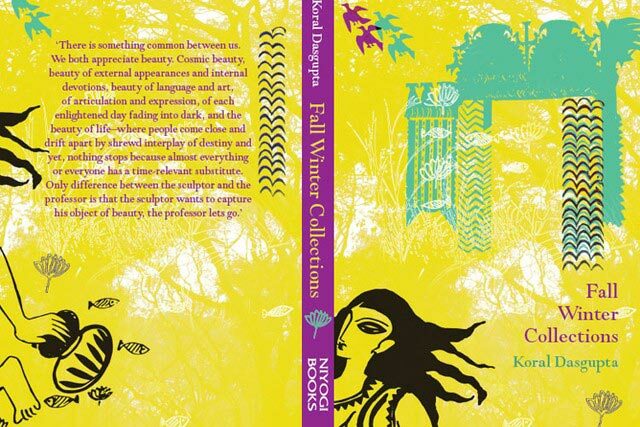 Fall Winter Collections marks the debut of author Koral Dasgupta in to the world of fiction. (Her earlier book, Power Of A Common Man, connecting with the consumers the SRK way.) But if you didn’t know that about her, you wouldn’t have noticed it, for she exudes such mastery over the language and knowledge of the backdrop in which the story is set. Shantiniketan comes across as such a stand out character, even though we know we’re following the lives of Sanghamitra and Aniruddh, that it sometimes tends to slow the pace of the story. There are parts which are predictable, and those which you feel you’ve read before, but this literary déjà vu is a result of the right chords strung. When the fiercely individualistic Sanghamitra and Aniruddh actually find solace in the other’s company, shedding their tough exteriors, revealing their vulnerability to the other as well as the readers, you cannot help but identify yourself a little bit with them. Fall Winter Collections is that book that will keep you warm on a cosy Saturday afternoon, when you cuddle up in your blanket with a piping cup of tea. At least that’s what I did, and let myself escape into that little childhood haven I created for myself during the times spent in Shantiniken when I was all of ten or twelve.